We designed a unicorn. 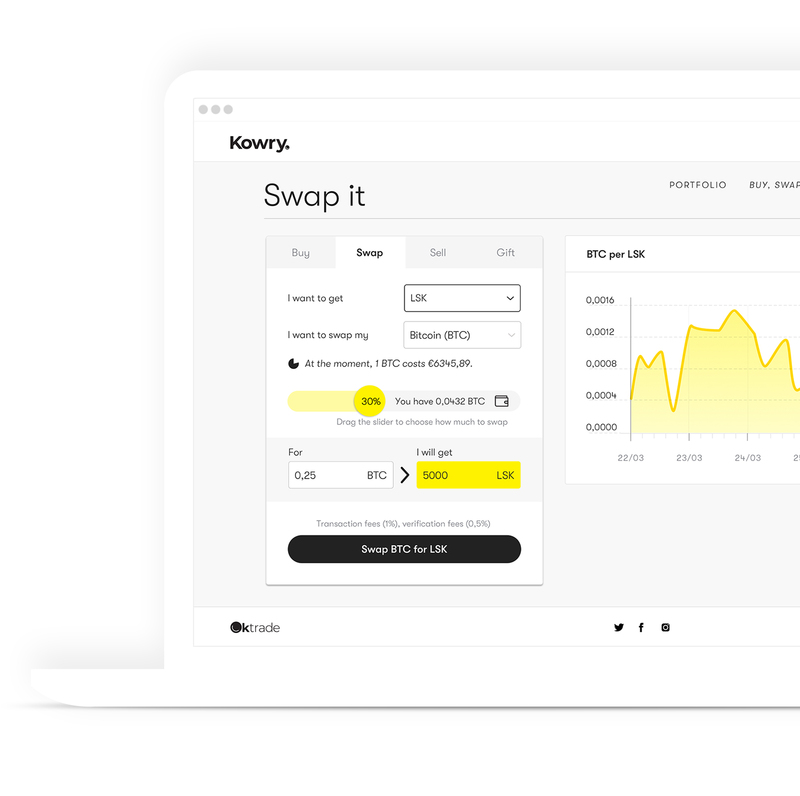 A user-friendly exchange for trading and storing cryptocurrency. Cryptocurrency is growing exponentially, with experts like Tim Draper predicting growth for Bitcoin to exceed $250,000 (€220.788)1 by 2022, yet only a handful of exchanges cater to beginners. So, when a enterprising start-up came to us with a simple but brilliant idea – a cryptocurrency exchange accessible enough to use from a bar – we wanted to make magic happen. The product would have two primary audiences. Their current users (tech influencers), and their growth audience which we dubbed 'non-tech & curious'. Tech savvy individuals were first adopters and if they liked a solution, they’d push it to their friends and family — the 'non tech & curious'. We quickly realised their existing branding didn’t meet either these technical or accessibility needs. Through our brand sprint workshop we identified what our user groups needed, and developed several concepts to address those needs. We had to simplify crypto to the everyday user without patronising the expert’s experience. We also needed to differentiate this new product from clients existing crypto offerings. We conducted a brand-hierarchy workshop, placing our new product where it needed to be in their portfolio. Then, we finished up with a naming workshop — which set the stage for the naming journey from which Kowry was ultimately born. Name in hand, our design team developed a stripped-down design that was approachable and human but stopped short of being 'dumbed-down'. Through both guerilla and formal testing our team validated our visual language to be sure both audiences were equally well served. The need to cater to two different audience types was an especially big consideration in UX. The complexity of trading, storing and buying cryptocurrency can be intimidating to beginners. Aside from combining these three formerly separate functions into one service, we needed to take users along for the ride while they were using them. This required creative thinking. We had to present multiple choices and options in a simple format. We had to make buying and trading cryptocurrency easy, we had to ensure users were informed when they made decisions. Our approach was straightforward. A conversational UX following a compensational style. 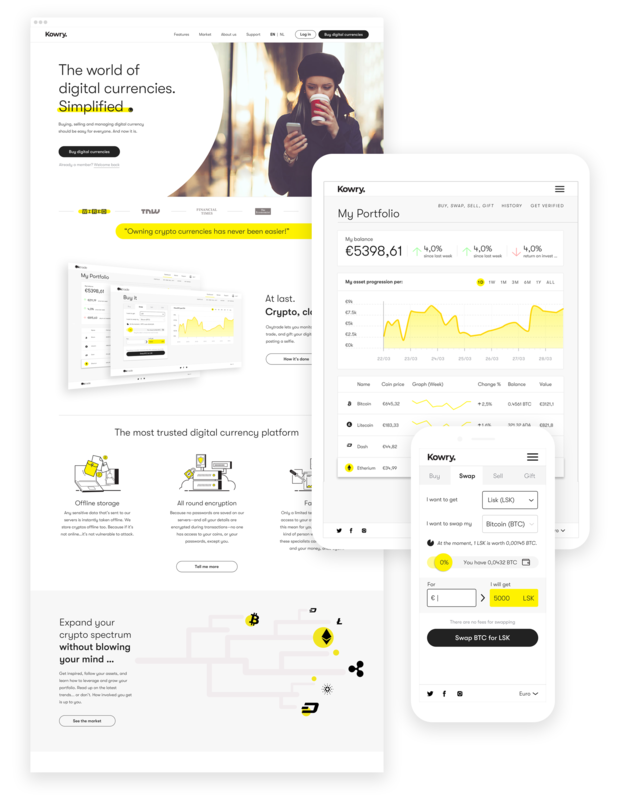 The interface simplifies complex processes into strings with an open form for currency, value, and trade-value, allowing the same forms to be reused across the site. Conversational UX delivers complex choices and options to users in an easy to follow format, leading from sign-up to purchasing currency, and quickly comparing values. It met all our goals for both user groups. One design system, three roles, any device. We designed a device independent visual language that negotiated the complex demands of marketing, financial data and personalised content. In order to be maintainable, this language needed to be encapsulated in a tightly controlled design system. In a process that saw designer/developer communication reach new heights we designed and built a component based system that ensured a seemless experience across different touchpoints and devices, and much, much, less code. Do you also have a complex challenge that needs solving? Get our lean toolkit. Build the products your market wants. Hurray! We Won a Lovie Award!